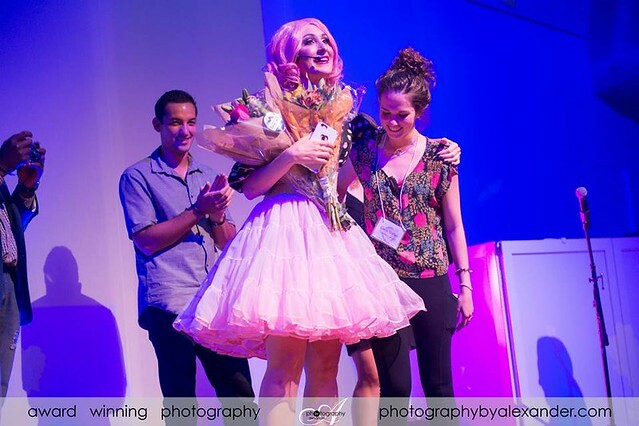 Nicole Gallub receives flowers at the Pelonkey Launch Party. Photo by Alexander Morozov. Last month, Pelonkey threw a launch party three years in the making. Founded in 2012 by Nicole Gallub, (better known to many as DJ Neekola), this digital booking agency gives freelance entertainers and event planners the power to take control of their careers, providing easy access to tools for creating contracts and invoices, and more importantly, cutting out the middleman to allow talent to make more income per booking. Planners have access to a pool of talent at their fingertips, and can negotiate directing with talent online. Shortly before the launch party, which showcased the variety of talent available for booking, we chatted with Nicole to discuss events, office culture, and how she came up with the name Pelonkey. Pamela’s Punch: Please share a brief educational/career background and why you started Pelonkey. Nicole Gallub: I have my Bachelorâ€™s degree in Information Systems from the University of Richmond. I previously had been working in the field of Information Technology for about 10 years and I had transitioned into a DJ/Producer on the side, eventually moving forward working full-time at that. As I had been working as a DJ, I found a lot of issues in the entertainment world that I had been experiencing, that my colleagues and my peers had been experiencing, so I decided to take my tech background to use technology to create a platform that would solve some of these issues. PP: I know you chose the name Pelonkey because you wanted it to be the only thing that came up when you searched it online.Â There must be a fun story to how you decided on this name. NG: (Laughs) Not really. I was just in the car driving to Richmond with an ex-boyfriend, throwing out random names, and that was one of them. I canâ€™t really remember the other weird names that we threw out there, but it sounded good, and it sounded like we could use it as a verb. What we like to do too is say PelonKid, PelonQueen, PolonKing, so we have our own little language to it. Really the whole point of that, honestly, was I wanted to start something from scratch. Iâ€™m just kind of breaking the rules a little bit when it comes to marketing, and not associating it with anything, except for our brand. I wanted to start anew so that when I searched for it, nothing would come up except for us, that we would own it, trademark it, and it would be our baby. It was nothing when I thought it up, and now it has become something that is really going to change the event industry. PP: What is the hardest part about running Pelonkey? NG: When youâ€™re starting the company you literally have to wear every hat. When you start a company you think, “Iâ€™m going to make a difference”, and “this is going to change the world,” but then when you actually start getting into it, you start realizing that you have to put on these hats that you are not very comfortable with, like investments and other things that you never learned in school because you studied IT and not business. You have to learn about accounting and calculating burn rates and the types of insurances that you need to have for your people. You have to pretty much do everything in the beginning and it is very overwhelming. Sometimes it is hard to focus on what needs to be a priority when you are in charge of so many different things. PP: What is the most rewarding thing about running Pelonkey? NG: When you see that you are really making a difference in peopleâ€™s lives. The events world is really close to me because Iâ€™ve lived it, and Iâ€™m living it still, and myself and my peers have been burned so many times just by wanting to do something that we love. I got so passionate about trying to help these people that I stopped what I was doing to create this. Weâ€™ve been running for three years and have stories and testimonials about how we’ve helped people get their money for an event that was cancelled and how we’ve helped make someone’s event a huge success because they were able to find the right entertainment. When you start to see that you are really making a difference in the world that you wanted to make a difference in, itâ€™s so rewarding. There is nothing better than the feeling like youâ€™re doing someone a good deed. An event without fun is just a bunch of people, standing around, looking at each other. One of the many talents featured at the Pelonkey Launch Party. Photo by Alexander Morozov. PP: What are your top goals for Pelonkey? NG: To standardize the way the entertainment world works and to educate people in the industry about the proper way to do business. We want to give people the control to do these things on their own so they no longer have to go to an outside company. These things are easy to do, but some people’s donâ€™t yet know know how to do it. Through Pelonkey, they are going to be able to do it. They are going to be able to find the exact type of entertainment that they need, and the entertainer is going to be able to take control of his/her career. PP: You have previously stated you would like to model your office culture after Zappos. What do you admire so much about the Zappos culture, and what do youÂ envision for your office culture? NG: I had participated in TechCocktailâ€™s Downtown Project tour, and part of their tour was a tour of Zappos, and seeing how they have totally changed the way people work. As soon as I walked in I could see how happy people were, everyone was working collectively. There wasnâ€™t really a hierarchy where people were better or bigger than other people. Everyone was one big force working together to make things happen, and they were being incentivized by really cool, fun things. Whenever they did a good deed they got Zappos dollars, and you could cash those in for cool prizes. It really shows that the people who created this culture really care about their people. They want them happy, and they want them working, and they want them inspired. What I liked about that was I also have a passion for people. With my history in corporate America, I always felt like a number. I never felt like the company actually cared about me. Going in and seeing a business that really cares about people really inspired me because this is what I want to become. I want to be a company that really cares about their people too, because people arenâ€™t just good workers, they are people. Yeah, they are working for you, but they are sort of like a family now, and they are part of your success, and you need to keep them healthy, you need to keep them happy. PP: Zappos is your role model of office culture. Who is your personal role model? 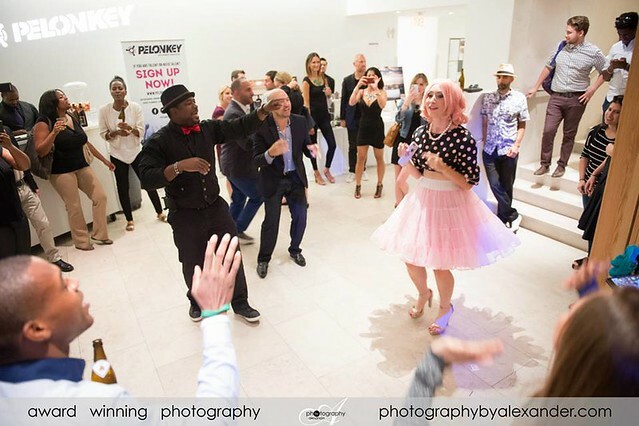 Nicole Gallub dancing with guests at the Pelonkey Launch Party. Photo by Alexander Morozov. PP: Other than your own launch party, what has been your most memorable event experience? NG: I have so many. My world IS events. Another event that I threw that had a big impact on my life was my album release party. It was like a smaller version of the launch party for Pelonkey. The party was promoting an album that myself and Rex Riot put together. I learned a lot about the events world from that. PP:Â Is there an event you want to go to that you havenâ€™t yet been? NG: Burning Man. It sounds so commercial now, but it still sounds really cool. People are just free to be their creative selves, there is a lot of art, a lot of talent, a lot of costumes, a lot of music, a lot of expression (a lot of drug use that I donâ€™t condone [laughs]). I would like to go to that someday if I can. PP: What are three things that all great events must have? NG:Â 1) Great entertainment. Entertainment makes or breaks an event. If you have a big party but nobody is entertained, then you just have a bunch of people there for a meeting-you need to have entertainment. 2) Organization. If you donâ€™t have planning then you have chaos. You have all these people showing up, and nobody knows what is going on, and itâ€™s a big mess. 3) Fun. An event without fun is just a bunch of people, standing around, looking at each other. When you start to see that you are really making a difference in the world that you wanted to make a difference in, itâ€™s so rewarding. There is nothing better than the feeling like youâ€™re doing someone a good deed.